Another weekend in Carlsbad, CA with Happy Meal and another opportunity to review a burger presented itself. 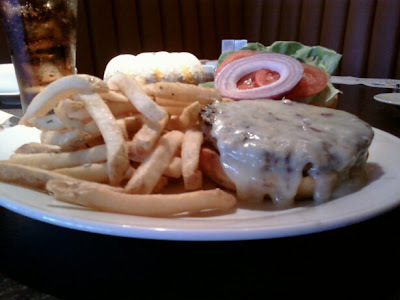 This time, we got a great deal at the Sheraton Carlsbad Resort and Spa with Hotwire, and it turned out that the resort restaurant, Twenty/20 Grill and Wine Bar, had a fancy burger. The Eighty/20 Cheeseburger came with Irish White Cheddar, Limestone Lettuce, Steak Tomato, Caramelized Onion Jam, and fries for $12. Happy Meal lucked out and ordered himself a mini pizza--smart kid. The Beef: The Brandt Beef sourced Chuck was the real stand-out in this dish. It was medium grind, 80/20 meat to fat (according to the menu), but judging from the greasiness of the burger, I would guess this was a lot closer to 25% fat. The beef was not juicy, which suggested that it may have been frozen at some point. The beef tasted faintly of aging, but not enough to matter. What the beef tasted of was BEEF. It was flavorful and very satisfying. 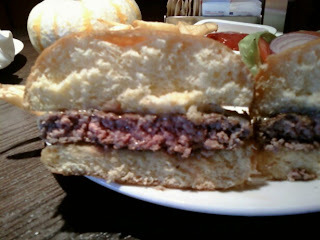 This was the same Brandt Beef that we enjoyed at BLVD 16 in LA and that they managed to utterly wreck at brgr in NYC. This was about a 6 oz. patty, and I ate more of than I intended to because of the tremendous beef flavor. The Sear: WEAK: They meekly grilled the burger, and whatever meager sear was imparted to the burger patty delivered no additional flavor or texture. The Seasoning: The seasoning was nearly nonexistent. There was a vague dusting of something savory on the outside and none at all in the actual burger blend. The Preparation: They grilled the Chuck burger to a reasonable Medium as I requested. The Cheese: Damn right! The Irish White Cheddar was a delight. It was a complex and creamy bite of salt, sharp, and iron. The cheese made up for the lack of seasoning and served to perfectly balance the strong flavor of the beef. The Bun: AWFUL. The bun was a huge disappointment. 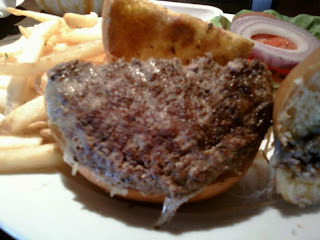 It was a big, pillowy, eggy, dry monster of burger desiccating badness. The beef flavor of the flat burger patty didn't stand a chance while enveloped in that monstrous, weakly toasted burger bun. Even the strong Cheddar was invisible to the palate when up against both halves of the bun at Twenty/20 Grill and Wine Bar. Meat to Bun Ratio: See above--the burger was a HUGE loser in this contest. The Fries: Yeah--the fries were pretty good--they were crunchy, and even Happy Meal put down his pizza to eat some of my fries. The Value: Nah--at 12 bucks, this was a poor value. For half the price, there was a burger at Ruby's Diner down the street, which was a better in nearly every way. Oh, the tomato slices were pretty mealy, too. Brandt Farms beef is a fine product, and it served, with the help of that fantastic Irish White Cheddar, to carry this cheeseburger over a couple of big hurdles. The bun that accompanied the Eighty/20 Cheeseburger was simply unforgivable. This cheeseburger was only reasonable good after I removed the massive top bun and ate it open-faced. Burger Review : The fine ingredients at Twenty/20 Grill and Wine Bar almost compensated for the weak preparation (seasoning and sear), but they failed to make up for the awful bun.